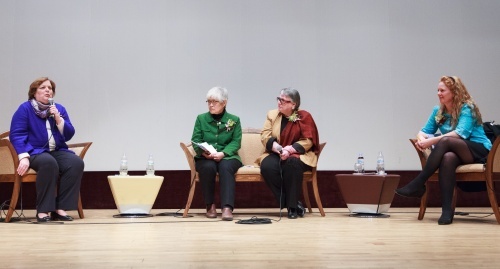 Speakers at the International Women’s Day celebration at Seoul Women’s Plaza on Friday highlighted the progress women and girls have made in science, but said there is still much room for progress. After a video presentation that was both bracing and inspirational, there were performances of the “geomungo,” a traditional stringed instrument, and story telling. This was followed by a discussion, introduced by Park Hyun Kyung, president of the Seoul Foundation of Women and Family, which co-hosted the event. “Unfortunately, science is commonly recognized as a male dominated profession,” said Park. The preconception that scientific subjects are for boys was a common theme, but all pointed out that it was not well founded. “I come from a generation where we heard ‘you’re very good at words, don’t worry about arithmetic,’” said Anne Ladouceur, who chaired the event’s panel discussion. One person working to involve more women in science is Lee Hei-sook, professor of mathematics at Ewha Womans University. As director of the Korea Advanced Institute of Women in Science, Engineering and Technology, Lee has led a support program for middle and high school girls, female undergraduates and female scientists and engineers. She said that when she returned from studies abroad, the lack of mathematics graduates meant that it was not difficult to get a job. But when she started teaching at Ewha, she found things were harder for her students. “They were quite talented but when they finished their studies and Ph.D.s they couldn’t get a job, just because they were women,” she said. This was the impetus for her WISE program, in which volunteers mentor students and academics to encourage participation in the field. Lee said that many women who had taken a break from work were eager to return, but couldn’t. Lee said that female involvement in science had noticeably increased, and that since a law was passed in 2002 to encourage women in science, a recruitment target had been put in place for state-funded science institutions. She also pointed out that the disparity in Korea between boys and girls in science and math had been wiped out from 2000-2009, according to the PISA surveys used to compare academic ability internationally. Lynn Lion, a professor of education at Seoul National University, used her experiences with the United States Agency for International Development to highlight the difference education can make. “I’m not sure that standing up and preaching always changes things, but education eventually really does,” she said. She went on to explain how a general education program in an Egyptian village had changed perceptions and rates of female circumcision there. She also explained how she had helped improve education for girls in Malawi. Not many girls in rural areas were not going to secondary school. Although the cost of tuition was just 50 cents, some just couldn’t afford it. USAID set up a program to help them, but for some reason the uptake was very low. When USAID sent Lion to investigate why, she found that shame was holding them back. Many who did apply got lost in bureaucracy. But at 50 cents, the cost was so cheap that there was little benefit in rationing it. So Lion proposed to apply the program to all rural girls. When they did, girls’ school attendance shot up. Shelley Luke Wille, primary school principal at Chadwick International School in Songdo, Incheon, explained how school activities as a child had transformed her from a stereotypical girl to one who was interested in science and exploring. She said she was happy with the level of enthusiasm for the sciences she had seen from her pupils, and that girls were not afraid to get their hands dirty. But she also noted that boys still rated their abilities in scientific subjects more highly than girls. Wille also set up not-for-profit group Virtual Explorers and explained how they had used the Internet to give school children access to real science experiments in the Amazon. Pilar Perez-McKay, one of the main organizers of the event, said the response had been positive. She added that the Seoul Foundation for Women & Family would co-host the event in 2013, when one objective will be to involve more Korean women.